To answer this question one must first answer the question: what is abortion? Abortion is simply a word used to describe the action of killing a human person in one of the early stages of that human person’s development, just as shooting is simply a word to describe how the human persons in that Colorado theatre were killed. Both words describe a different method used to end the life of human persons who are all in different stages of their life and development. In the same way, when I compare the Nazi Holocaust and the Abortion Holocaust, I am showing that they are both horrific events that have claimed the lives of millions of innocent human persons. One took place 70 years ago and one is taking place right now. I could easily show comparisons to many other events in history such as Columbine, slavery, earthquakes and many more tragic events that have claimed so many innocent lives. Many people think that I am making these comparisons to show the similarities of the events in question and abortion, but that is not really the case. I am not merely trying to show them as the same thing, I am trying show the horrifying fact that we don’t see them as the same thing. When I make these comparisons it is because, while I am grieving for the loss of those innocent lives lost in Colorado at that theatre, I am also in pain for the other thousands of innocent human person killed on the same day that so few people are crying for. I am trying to shake this world and make us realize that there are thousands of innocent human persons being murdered in buildings every day around the nation and the media are not there to tell their story. The Planned Parenthoods and abortion clinics have successfully lulled America into silence about the bloodshed behind their doors. They have convinced so many that this is nothing more that a choice being carried out to help women. They have declared war on women and innocent children in the womb and have disguised it as liberation and freedom. In carrying out this war on women, the abortion industry has been able to silence the outrage that should be shown towards this abortion massacre. They have been able to mask a horrific and violent action as a healthcare right that needs to be funded by our government. I will be totally honest here: I do not simply believe I have the right to make these comparisons; I believe I am compelled to make these comparisons. I believe that the blood of 55,000,000 of my fellow Americans who have been massacred by abortionists must be cried for. 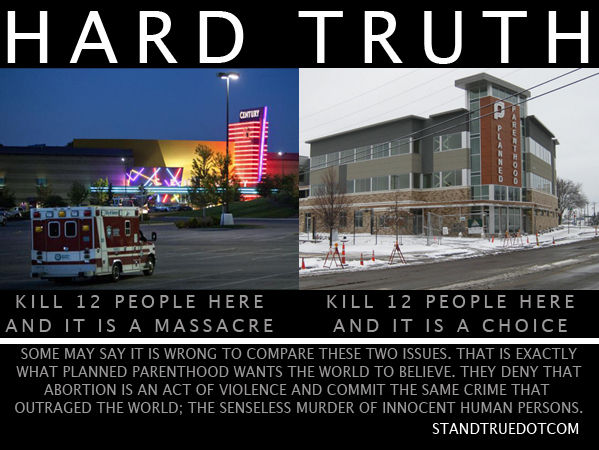 In my most recent comparison I created a graphic showing the Colorado theatre where the shooting took place alongside a picture of a Planned Parenthood. I said that when 12 people are killed at this theatre it is called a massacre and when 12 people are killed at the Planned Parenthood it is called Choice. I was not shocked by the responses I got from non-Christians or from pro-abortion people; I was shocked by some of the comments I got from Christians and people who identify themselves as pro-life. I was told that calling abortion murder is judgmental and as Christians we are not called to judge. I have to ask these people if they are calling what the shooter in the theatre did can be called murder, or is that being judgmental as well? I was told that it is just too soon to compare things like these because those people just died three days ago. While I am so very saddened by their deaths, I am also saddened that in the four days since that attack in Colorado, almost 16,000 innocent human persons have been killed in abortion clinics. Since January 22 of 1973 over 55,000,000 innocent humans beings have been killed by surgical abortion in America alone. It is not too soon; it is actually long overdue. I am being told that I am just opportunistic. Yes, I am. I am using this opportunity to bring to the light the senseless and brutal murder of millions of innocent children who deserve to have their deaths mourned. I am using this opportunity to show the hypocrisy of a nation who defends, protects and funds the murder of her own citizens in the name of choice. This graphic comparison was meant to do many things, and one of those things was to create a buzz and get abortion talked about. It worked. When abortion is being talked about and the truth is being exposed, lives are saved. One of my goals as an abortion abolitionist is to never allow abortion to fade away as a non-topic. My goal is to make it so prevalent and so front and center that this nation and the world are forced to open their eyes and see it for what it truly is. Abortion is an act of homicide and I will take every opportunity to expose this until we see the abolition of the abortion massacre.